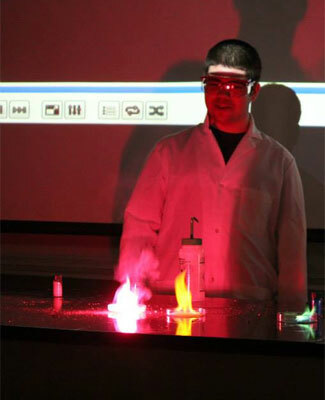 The Northern Illinois University Chemistry Club invites the public to its spring 2015 Chemistry Demo Night at 7 p.m. Friday, March 27, in Faraday Hall 143. Faculty advisers helping with this year’s demo preparations include Oliver Hofstetter, Narayan Hosmane, Lee Sunderlin and Chong Zheng. All ages are welcome to attend the free event. Featured demonstrations will be both fun and educational and will include Underwater Fire, Genie in a Bottle, Liquid Nitrogen Explosion, Rainbow Fire, Glowing Ice and Ice on Fire. The experiments planned for the evening include flashes and bright lights. Reactions might also emit small amounts of smoke and produce loud sounds. For safety precautions, members of the audience will not be permitted to sit in the front row. As always, free liquid nitrogen ice cream will be served after the experiments. Parking will be available in the NIU Parking Deck along the west side of Normal Road, about one block north of Lincoln Highway (Route 38) after 6:30 p.m. (except for reserved and handicapped spaces). For more information, email dboland@niu.edu.